I’ve noticed that, especially around where I live, there’s a tendency amongst many of us (myself included) to opt for comfort over all else. 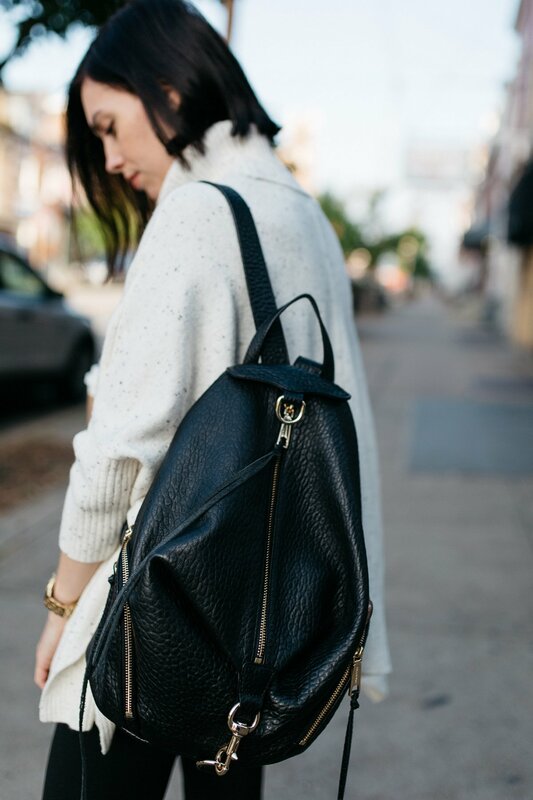 A lot of times that means athleisure, which has become oh-so-popular over the last few years. To be honest though, I don’t usually feel all that confident in athletic wear (maybe it’s because I feel like a phony since my relationship with workouts is less than committed). Instead, I like to find casual pieces that I can incorporate with dressier shoes and accessories, so that my “dressed down” outfit still looks intentional and put together, versus sloppy and lazy. Let me confess that I’ve been spending any and all of my free time soaking up all things fall. (I know that means I am “basic,” but this is truly my favorite time of year.) I wish I could bottle up the crisp air, spicy scents, and comforting flavors that make this season so special. 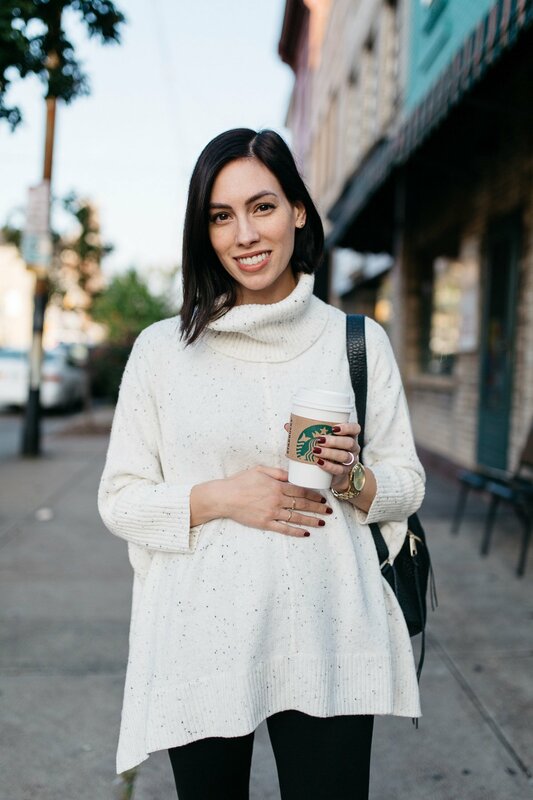 But, since I can’t, I just surround myself in mulled spice and vanilla pumpkin candles, and dress in cozy sweaters like the one in today’s outfit post. I gravitated to it immediately because of its bump-friendly swing shape, but also its longer length. 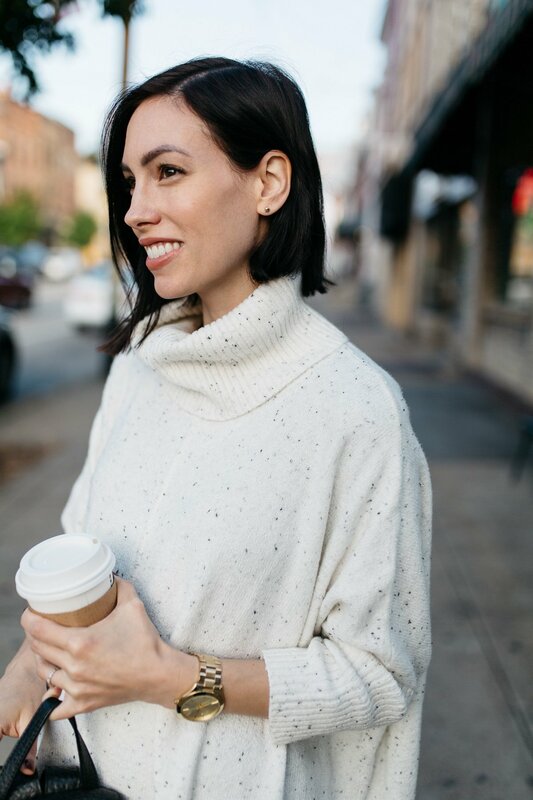 Side note: I snagged this sweater at 40% off–I highly encourage you to keep an eye out for another sale because LOFT is famous for having them all the time. Poncho-style sweaters are any girl’s best friend who is self-conscious of, or looking to camouflage, her midsection. 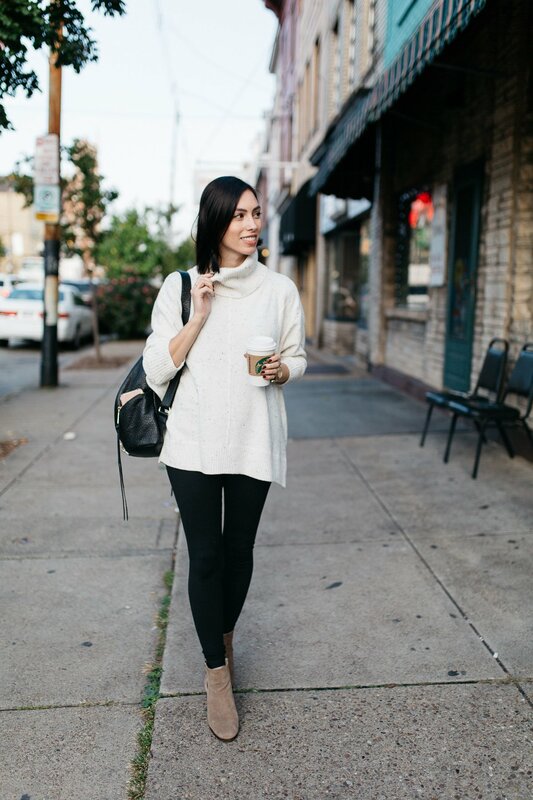 The longer length means that we can get away with pairing this sweater with leggings (woo-hoo for comfort!) and tucking them nicely into our favorite ankle booties, tall rain boots, or over-the-knee boots. If your weather is on the warmer side, this would be equally adorable with a pair of sneakers or slides, and will look just as put-together. 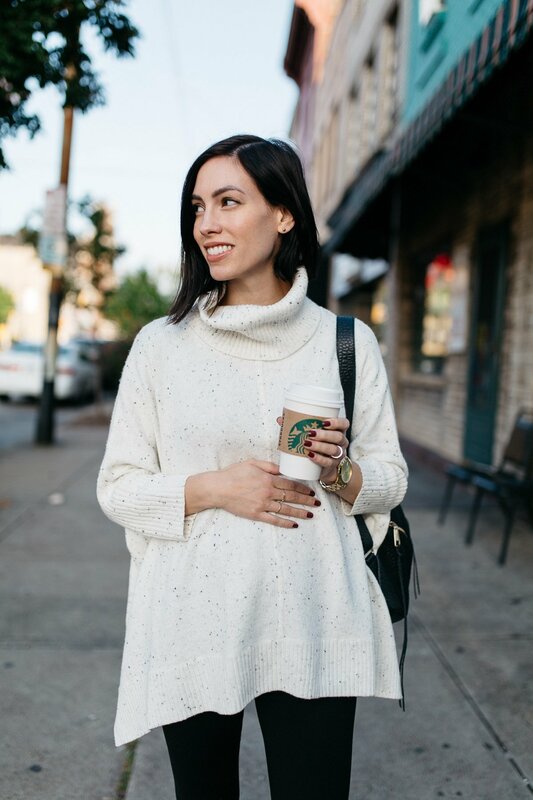 In general, my rule is simple: you can wear leggings and look appropriate if (a) your top is a bulky sweater or long [flowy] tunic, and (b) the hemline of your top falls at your mid- to upper-thigh. Being blunt, if your top covers up your bum and your lady parts, you’re good to go. 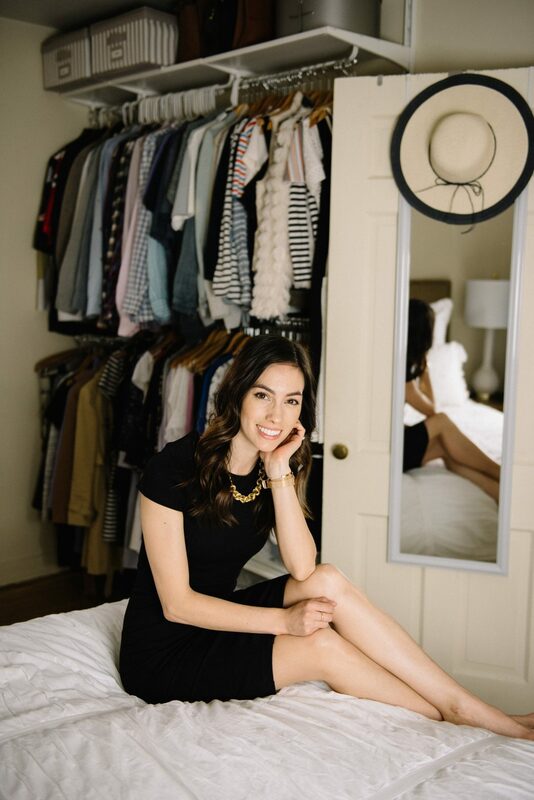 By choosing a comfortable, yet more dressed-up top, your look will become instantly more put-together than if you instead opted for a workout tank, oversized sweatshirt, or long t-shirt. Let me be clear: there’s nothing wrong with those combinations, but they also have their time and place–mostly at the gym or in the comfort of your home. 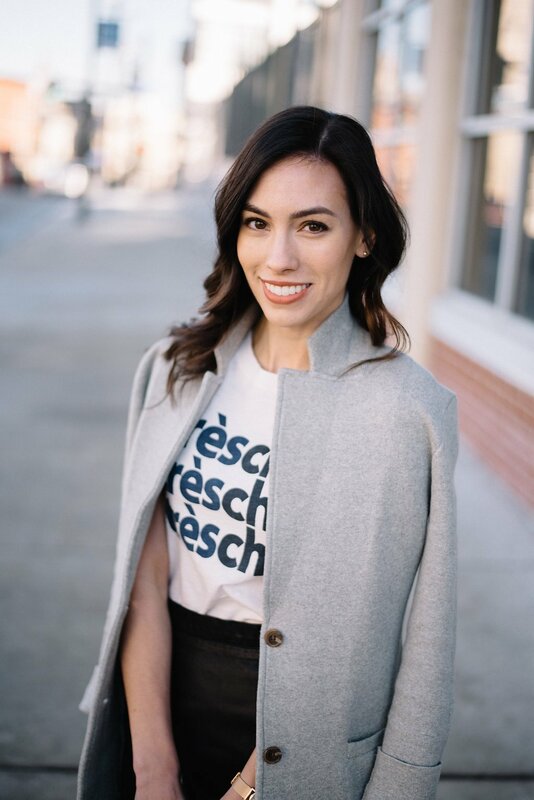 If you’re going out to run errands, meet with friends, or attend appointments, take the extra minute to throw on an appropriate top so that you can look and feel like the chic, modern woman that you undoubtedly are.